A huge welcome to everyone – new followers as well as old friends. So here we are at the start of another month! It is so hard to believe we are already in October. Halloween is my favorite time of the year, so with that said, yes all my decorations are out, we are making costumes, and attending all the Halloween festivities that are open. I hope you are getting ready and as excited as I am for the 31st. Today I would like to share a few of my favorite Halloween-themed projects with you. Sit back and take it all in! 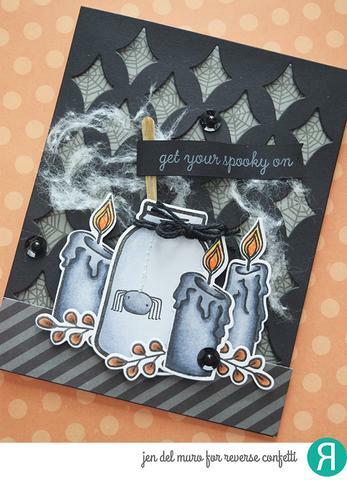 Have you started thinking about creating your Halloween cards? Since it’s the beginning of the month you still have plenty of time to start. These fun cards will help you catch that Halloween spirit. Are you having a Halloween party? These cute cards can also be made into a party invitation as well. This spooky Halloween card is perfect to send out to your family and friends. First start with the Spooky Tree die from Spellbinders and let your creative mind go to work. Elena used champagne glitter cardstock and hid her tree by the Tree’ n Web piece cut out of black. This created a landscape for the background. Add a black cat, bats, and “Spooky” to complete your card. What a fun and easy project! I give all of you wonderful crafters a high five for sharing your fabulous Halloween homemade cards and putting a big smile on many faces! Be sure to stop by Spellbinder’s blog where you can see the steps that Elena took to make her cards. You will also find many wonderful ideas and techniques from Elena Olinevich. Who would have ever thought to take a Christmas candles set and create a spooky, fun scene for Halloween? That is just what Jennifer del Muro did. I love her concept, so when purchasing stamp sets, try to incorporate a way to make the stamp set usable year round. Sometimes that isn’t possible, but by using your imagination you will be surprised at how many stamps you can turn into a holiday project. I think this card is just so adorable. What’s not to love? Big hugs to Jen for sharing this adorable card with us. Jen used her sewing machine to stitch the web on her card, along with several fun stamps colored with her Copics. Click here for the steps from Jen on how she created this adorable card along with the supplies that she used. You will love her great ideas for Halloween. 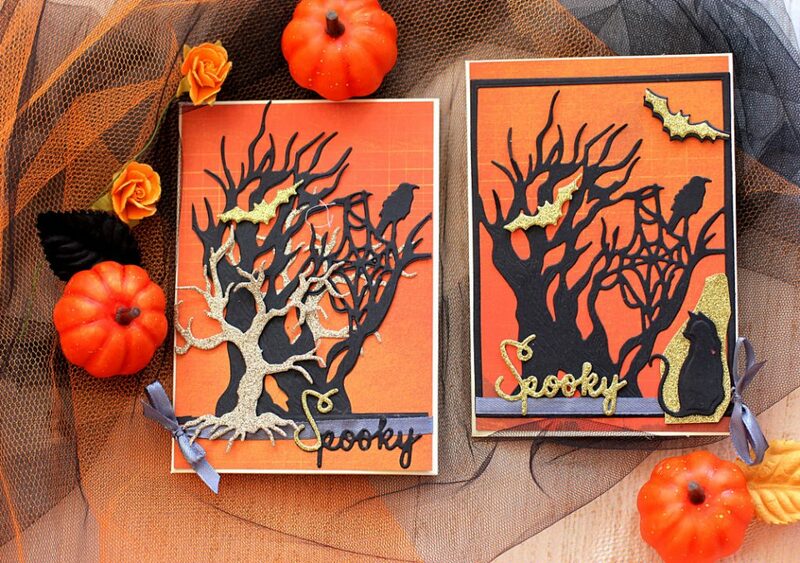 Have fun creating your spooktacular cards for Halloween! I am sure you have some special friends, co-workers, neighbors, and family that you love to take a little treat to at Halloween. These adorable treat bags will be a big hit and everyone will see how talented and creative you are! 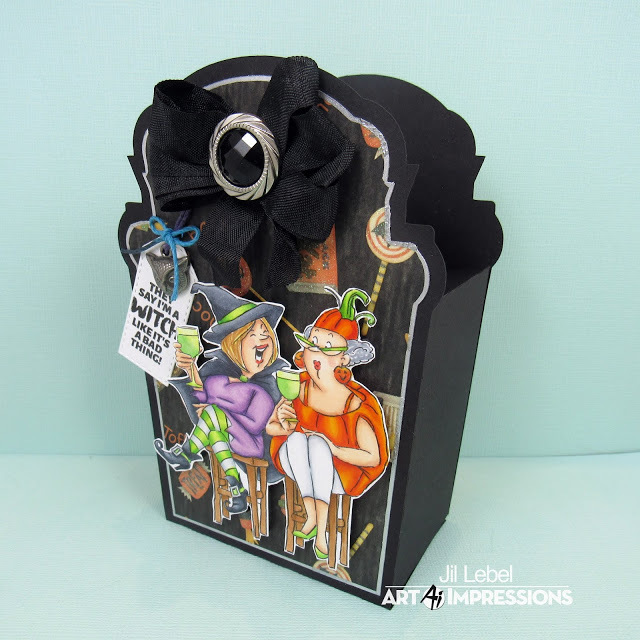 The tombstone gift bag is a Silhouette Cameo file that was cut in two pieces. It was assembled using thin double-sided tape adhesive. A top layer of decorative paper was cut and edged with a Pilot silver marker. And of course, I love all the visual interest the Art Impressions Ghoul Friend set adds to the design of the bag. Darling! You will love the fact that they are so fun to complete; they provide an instant gratification. Not only will you love your completed bags, so will your family and friends as you pass them to each one. These adorable treat bags are sure to put a smile on the recipient’s face. Be sure to stop by Stampyra so you can see how easily this project comes together. You will find all the materials that you will need to start creating yours. While you are visiting Jil’s blog be sure to check out her other fabulous projects as well. You will leave feeling so inspired! 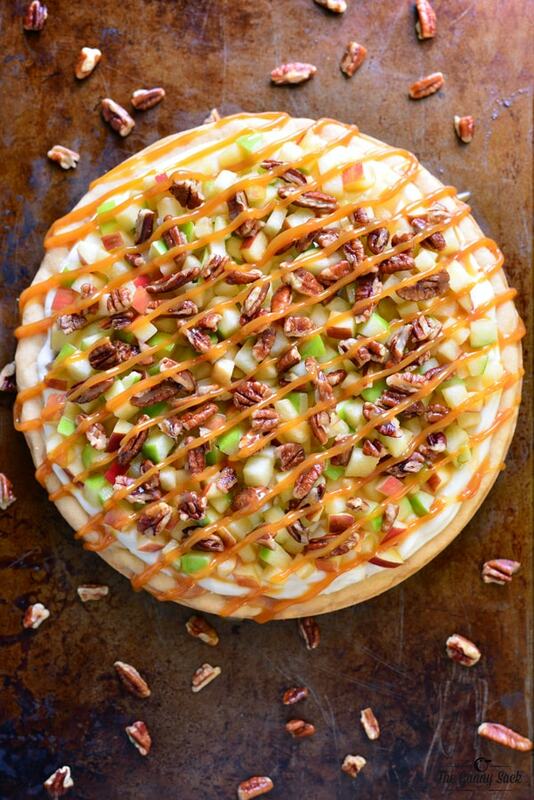 Grab a bag of apples on your next shopping trip because you are going to want to make this warm Caramel Apple Fruit Pizza topped with pecans and drizzled with caramel sauce. It’s a delicious way to celebrate the flavors of fall. Everyone will love how pretty the fruit pizza looks and will agree that it is delicious. Believe me, they won’t take just one piece! Caramel Apple Fruit Pizza! Yummy! If you are ready for fall baking then this is the perfect kick-off treat. Apples, caramel, pecans, cream cheese frosting, and cookie crust are flavors that are delicious all year round, but seem to be extra perfect for fall. Click here so you can visit Tonia Larson’s blog The Gunny Sack, where you will find the ingredients and recipe for this yummy dessert. Enjoy! Thank you for sharing a part of your Saturday with me. I hope this beautiful fall day will find you with some time to create at least one of those wonderful projects you want to make. Have a wonderful week ahead, and I look forward to seeing you back soon. This entry was posted in At Home, Blog, Card Making, Recipes, Saturdays With LeAnn, Scrapbooking, Stamp & Scrapbook Expo, Stamping and tagged Apples, Art Impressions, Candles, Caramel, Cookie, Copic Markers, diecuts, Elena olinevich, Fruit Pizza, Ghoul Friend Stamp Set, Halloween, Inviations, Jen del Muro, Jil Lebel, Pecans, recipe, Reverse Confetti, sewing, Sour Cream Frosting, Spectrum Noir Paper, Spellbinders, spooky, Stampyra Blog, The Gunny Sack, Tim Holtz, Tonia Larson, treat bag, trees. Wow! What amazing Halloween creations! I am so loving your papercraft work! Thanks for sharing!